There is a variety of benefits that come with adding tile to your home in whatever room you see fit! Tile is sturdy and makes damage much harder to occur so it will last you for a while, and also tends to be waterproof. This is great for areas like the bathroom and kitchen where spills or other accidents may happen to protect from water damage. In that vein, it’s also much easier to clean as well! Due to the array of differing types and looks, it also makes it easy to find the perfect style that suits the look of your home overall. Should anyone in the home suffer from allergies, it’s also hypoallergenic! While there are of course variations of them all, there tends to be four main types that most technicians use. Ceramic is the most common since it’s the cheapest, while natural stone is the most expensive. That being said, natural stone is a beautiful addition with stark colors and tones, as well as lovely patterns in types like granite and marble. Glazed porcelain is the strongest of them all, and is also the most resistant to bacteria and mold. Glass can come in all sorts of colors and looks, but has to be treated more carefully. Our experts will get to work right away on adding tile to the area, wherever you see fit. The designated spot will be cleaned thoroughly to ensure that the adhesive will stick properly, and be examined for any dents or otherwise that might disrupt the smoothness of the tile once completed. The tile pieces will be applied in the determined pattern with the adhesive using a spacer to keep them even. After the adhesive dries, the grout and sealer can be applied. It’s time to give your household a brand-new look before you know it! 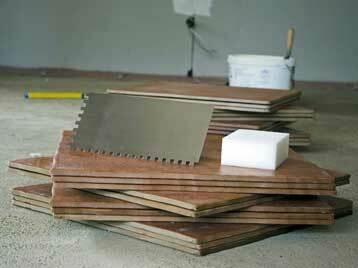 Call Drywall Repair & Remodeling Calabasas today and let us schedule your appointment. You won’t regret it!